Home > Uncategorized > How to Upgrade Your Nexus Device to Android v5.0 Lollipop Right Now ? How to Upgrade Your Nexus Device to Android v5.0 Lollipop Right Now ? This will be a happy news for Google Nexus owners. They will get updates to the latest vesion of Android, v5.0 Lollipop very soon. Factory images for the new update is available to download across several Nexus versions now. Access Google developers page here, choose and download images based on your models to give it a new, redesigned look.But before installing factory image on the device, you have to do certain things. 1) Take a backup of the entire data as you will loss everything on the phone when the process is finished. 2) You have to unlock the bootloader first. There are several tools available for the purpose, but we advice you to use reliable tools like Nexus Root Toolkit, we used in this tutorial. We assume you are using Windows computers. 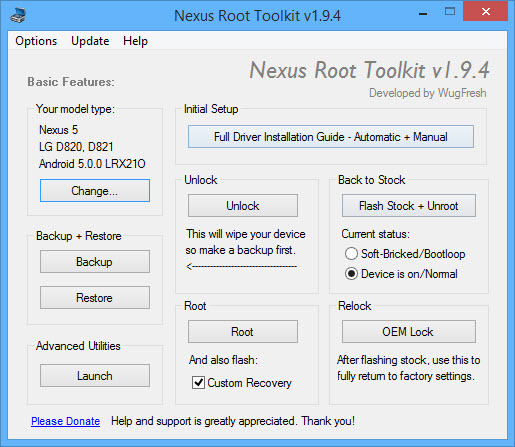 Check the supported device list provided in the above site, download and install Nexus Root Toolkit on your PC. Now you may need additional drivers to build a connection between Nexus and computer. If the system is not recognizing your device, click on the ‘Full Driver Installation Guide’ button on the rootkit and it will do the rest. Sometimes it will ask you to restart the computer, kindly do the same. Click on ‘Unlock’ button in rootkit and follow the further instructions carefully. Your device will reboot a couple of times, but don’t worry about that, it is a part of the unlocking process. After that, go to the settings, click Build number to enable Developer Mode and select USB Debugging. Now it’s the time to install Factory image on the device. Go to the first link in our article and install the correct image for your model. In the Nexus Root Toolkit, click the ‘Flash Stock + Unroot’ , locate the factory image you have downloaded in the last step. Paste the MD5 Checksum which comes along with your download link of the image. It will take some more time to finish the process. When the phone is rebooted, you will see fresh install of Android 5.0 Lollipop. Rooting process is a little bit complex, it will void your warranty and some times your device may damage for ever. Beware of these facts and it is better to get support from a technical expert well in advance before starting the process.